Although many of these lyrics are written with music almost universally known, and many of us are proud to sing the songs with every lyric intact, how many of us are really aware of what some of the lines actually express besides fitting neatly with the music? I was once going on a train somewhere when it was raining. We were passing by a wheat field, and I thought of the line “the wavin’ wheat can sure smell sweet when the wind comes right behind the rain,” and it took me a few seconds to remember it was in the title song of Oklahoma! It seemed so real in this nowhere place. And how many people have had the feeling of being “starry-eyed and vaguely discontented” or “gay, in a melancholy way” without remembering it came from “It Might as Well Be Spring”? We remember “you are the promised kiss of springtime” from “All the Things You Are,” but let’s go a little further on to experience the idea, that also “you are the breathless hush of evening that trembles on the brink of a lovely song.” We may know those words, but do we really think about the idea of your kiss waiting so precariously for the lonely winter to pass? Will it still be waiting or would it have fallen off the “lovely song” by springtime? After my father’s salad days, mostly at college and shortly after, rhyming “love and above,” “moon and June,” as well as little chorus ditties that explain why “I’m the boy (girl) for you,” he started writing lyrics and working with stories that had more of a purpose, going into characterizations and giving them some depth of feeling. Besides doing research on the themes of the librettos he was working with, he started to take walks to get to know his characters and how they were to be portrayed and, what was probably the most important, to learn the colloquialisms of speech they would use in their period and locale. We don’t know if they talked together, because we were not invited to accompany him. Some are offended by Show Boat, the musical produced with Jerome Kern in 1927. White people looked down on “colored people,” using them for back-breaking work. So the show is often called racist. But I believe it to be the first protest show ever presented on the musical stage. The ever-present theme in “Ol’ ManRiver” is in itself a protest by the “colored people” who want to leave the Mississippi and get away from the “white man boss.” (“Don’ look up an’ don’ look down. You don’ dast make de white boss frown.”) Yet they realize the futility of wishing for a better life. Life, like the river (“What does he care if de world’s got troubles? What does he care if de land ain’t free?”) keeps rolling along. There is very young love (“Sixteen Going on Seventeen”), and settled love (“An Ordinary Couple”). Drawn across the evening sky. One old couple walking hand in hand. Jerome Kern liked it so much that he set it to music. My father’s wife Dorothy liked it so much that she made a sampler of it and framed it. I like it so much because it shows my father was a true poet who could write about everyday things and deeply though simply express them. His positivity often resulted in using the word “dream” in his lyrics. 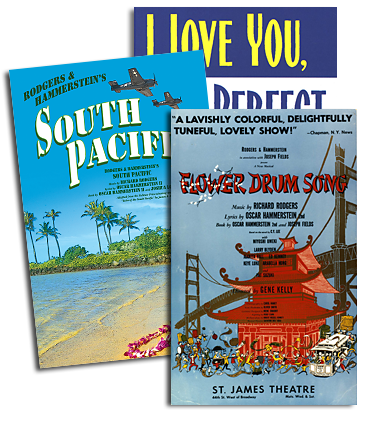 In fact, he found it in so many songs that he decided he would avoid the word for his next show, which was South Pacific. But it appeared there in more songs than in any other show he had written lyrics for! The song, “A Puzzlement,” often infects the audience with humor regarding the dilemma of a king. But almost every verse is relevant to human nature. He’ll fight to prove that what he does not know is so! Life is a puzzlement, and though his day in the hills has come to an end, this cockeyed optimist, with his dreams of a hundred million miracles, has blessed his homeland forever. **Attention all NYC-area residents!! Ted Chapin, President of The Rodgers & Hammerstein Organization, and Amy Asch, editor of THE COMPLETE LYRICS OF OSCAR HAMMERSTEIN II, will hold a discussion about Hammerstein's life and work at the New York Public Library for the Performing Arts at Lincoln Center on Thursday, January 15 at 6PM (admission free). For further information please call 212-870-1673 or visit www.nypl.org/lpaprograms.